Austin, Texas is the fastest-growing U.S. city with an increase in population from 750,491 in 2010 to 950,715 in 2017. A phenomenon worth exploring here is the response of the construction market to a population rate that is close to a million. Gavop recently used statistics published by the Austin Development Service Department to examine the highest construction-related permits (in dollars) issued to contractors for residential and commercial projects. Looking first at commercial development, the largest issued permit between 2015 and 2017 was valued at $167 million and issued to J.E. Dunn Construction Company for a hospital construction project. The second highest permit was $134 million and issued to Balfour Beatty Construction LLC for a new construction project. The third highest permit was valued at $127 million and issued to Austin Commercial LP in August 2017 to build a parking garage. 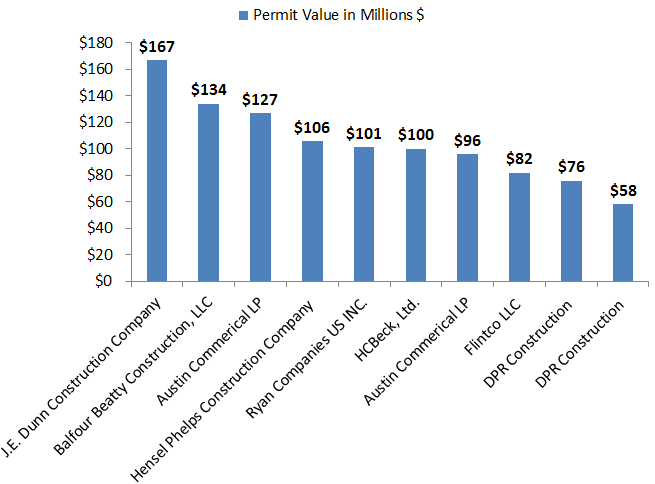 The following graph depicts the construction companies that received the 10 highest commercial development permits in Austin between 2015 and 2017. Next, an exploration of the highest permits for residential construction issued in the recent years in Austin, offers useful insights. With the mentioned increase in population, new development is necessary to cope with the rapid growth rate. Interestingly, the highest residential construction permit issued in Austin between 2015 and 2017 was for a four-floor single family home with 7 bedrooms and 13 bathrooms, which clearly seems like a mansion more than a home. The permit was issued to Dalgleish Construction Company in October 2017 for a value of $19 million. The second largest residential permit was also issued to Dalgleish Construction but the value doesn’t even come close to the $19-million-dollar home. Valued at $4.8 million, the permit was utilized to construct a single family home with 2 bedroom and 4 bathrooms. The third largest permit was valued at $4.5 million and received by Michael Deane Homes, Inc. in March 2016 for a home with 7 bedrooms, 8 bathrooms, and converted porches. 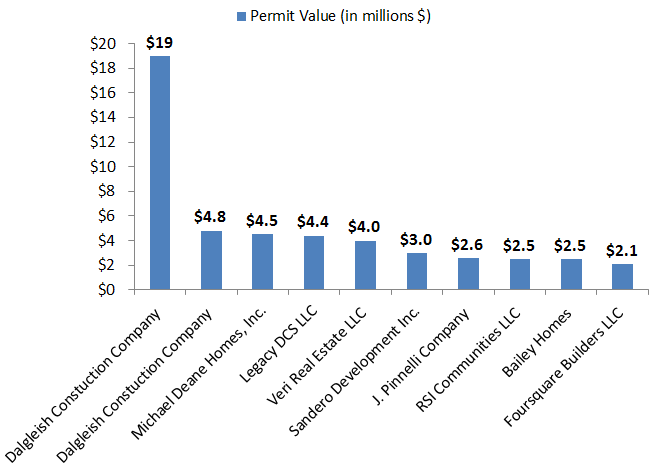 The following graph ranks companies with the 10 highest residential construction permits in Austin for 2015-2017.